Review by AllTheBestFights.com: 2018-10-07, spectacular finish between Naoya Inoue and Juan Carlos Payano: it is very close to get four stars! The undefeated world champion in three different weight classes Naoya Inoue entered this fight with a perfect record of 16-0-0 (14 KOs=88%) and he is ranked as the No.1 bantamweight in the world. In his last three bouts he has won over Antonio Nieves (Inoue vs Nieves), Yoan Boyeaux (Naoya Inoue vs Yoan Boyeaux) and Jamie McDonnell (Jamie McDonnell vs Naoya Inoue). His opponent, the two-time Olympian and former Wba and Ibo Bw champion Juan Carlos Payano, has an official boxing record of 20-1-0 (9 knockouts) and he entered as the No.10 in the same weight class. He suffered his only loss in the rematch with Rau’shee Warren in 2016 (via majority decision, Payano vs Warren 2), after this bout he has beat Isao Gonzalo Carranza, Alexis Santiago (Juan Carlos Payano vs Alexis Santiago) and Mike Plania (Juan Carlos Payano vs Mike Plania). 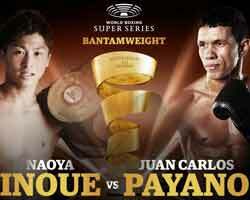 Inoue vs Payano is the quarter-final of the World Boxing Super Series bantamweight tournament (WBSS – Muhammad Ali Trophy) and it is valid for the WBA World bantamweight title (inoue’s first defense). Watch the video and rate this fight!